Transactions initiated at Interac® devices by cardholders are routed to On-Line's switch for authorization. If the host system is unavailable, our 'Stand-In' services will provide your cardholders with 99.9% system availability. All transactions processed in stand-in mode are sent to the host system through store and forward (S&F) as soon as the connection is active. 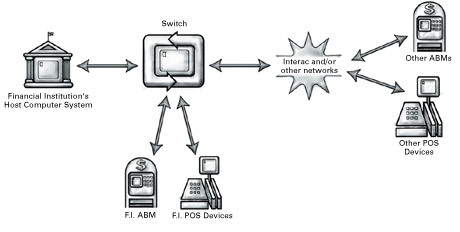 If your institution operates ABMs and/or POS devices and you wish to provide service to Interac® cardholders, your devices can be connected directly to On-Line's switch to process both On-Us (your cardholders) and foreign transactions. Our system also provides daily reporting, real-time access for monitoring and hot-card procedures.